Fields of cheerful, yellow wildflowers decorate the High Country in early Spring. Because the climate of Northwestern North Carolina is so drastically different than the surrounding communities "off the mountain", spring comes weeks later. It's worth the wait! On our daily hikes through the mountain trails, we find all sorts of early blooming wildflowers including Dwarf Iris, Trillium, Phlox, Mayapple, Galax, Buttercups, Great Chickweed, just to name a few. This particular field is full of Hawkweed. Although considered a "pest" plant, you can't deny that it provides a magical backdrop for portraits. Our subject was thrilled to run through the field, gathering flowers while basking in the warm sunshine. As she laughed and played, we created this lovely ILLUSTRATIVE PORTRAIT. Illustrative portraits are spontaneous, full of motion and emotion. Although we always create CLASSIC PORTRAITS at each session, there's always plenty of time for more relaxed, fun images. The color harmony is particularly wonderful in this portrait. 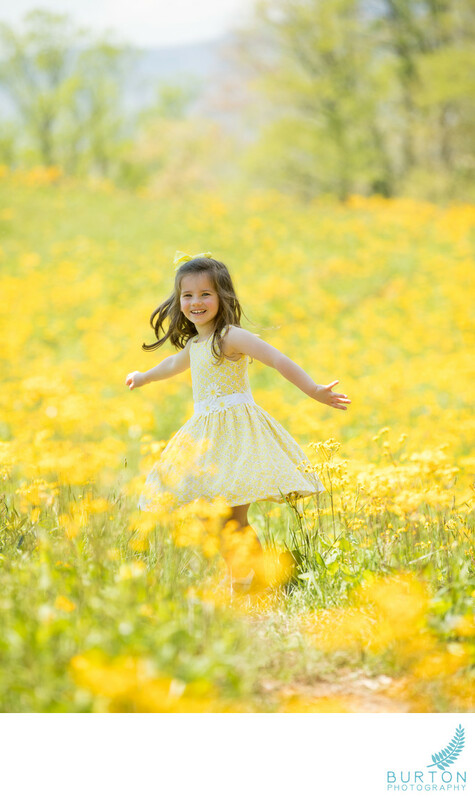 Our beautiful subject loved that her dress matched the flowers that filled the field. We'll help take the worry out of the question "what should I wear" with our suggestions based on years of experience. We're here to help you.